I've finally caught up with listing available items on Etsy! I went on a dyeing binge in February and March, and I have lots of colorful yarn and fiber to show for it. But I want to dye more, which means I need to make some room available. So I'm having a sale. For the month of April, everything at the shop is 15% off! Just enter the code AprilSaleNoFooling in the Coupon Code box during checkout. Here are some of my recent additions to the shop. As promised, I've put up the first batch of my hand-dyed yarn on my Orchid base- 100% superwash merino sock yarn. I also put up the first few of my Clover base - 100% merino worsted weight yarn. This one is not superwash. I put up one skein of the Goldthread base sock yarn - 75% superwash merino for softness, 20% nylon for strength, and 5% gold-toned Stellina for sparkle. I'm debating whether to get more of this, and if I do, to stick with gold or go with silver. I put up spinning fiber - polwarth, targhee, BFL, merino/silk, romney cross, and CVM. 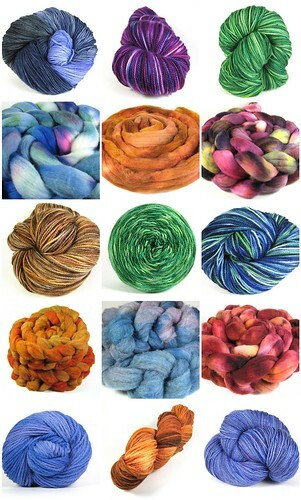 Lots of pretty colors, all available at The Spinning Daisy shop on Etsy! Coupon Code Fine Print: The discount will not apply to shipping. The coupon code expires at the end of the month.